Well, I'm back. With the help of TomCofer and Duck and a little nagging from yours truly, we have resolved the posting problems I had with my first attempt at a "52" project. This one will be an assortment of images: colour, infrared false colour, and black and white conversions from both colour and infrared images. To quote Tom Hanks character in the film Forest Gump; "Life is like a box of chocolates, you never know what you are gonna get." This is an apt description of this "52" for me. 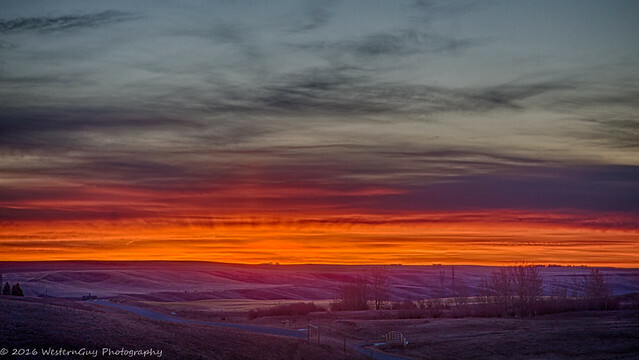 This first image is, in my mind, a fitting start to this new 52 - sunrise on the prairies. It was shot, last Wednesday, in the farm fields north of the City. It is a 5 image HDR taken with my tripod mounted Canon 1D X and a 24-105mm L IS lens, using a remote shutter release. Processing was done in Lightroom and Nik's HDR Efex Pro 2. As usual, comments and questions are welcome. P.S. Does anyone know how to get rid of the "Flickr" stuff without screwing everything up? WesternGuy wrote: P.S. Does anyone know how to get rid of the "Flickr" stuff without screwing everything up? OMG , you guys still have this crazy time limit on editing posts, something I will never understand . We are, after all, consenting adults and should be able to do anything we want with OUR personal posts. Come on guys, get some common sense into this and lets free it up for all to edit their own posts at ANYTIME. Personally, I resent being treated like I don't know what is best for me! After all, "it" is my post and if I want to delete it, for what ever reason, then I should be able to do that. I do not know any other forum that places this kind of restriction on its members and it is frustrating to say the least, and maintain a semblance of politeness. Tom, I can't edit my post, but I will keep your instructions for my next one. Thanks. I have pasted them into a OneNote page, so you can remove them from my posting. WesternGuy wrote: OMG , you guys still have this crazy time limit on editing posts, something I will never understand . We are, after all, consenting adults and should be able to do anything we want with OUR personal posts. Come on guys, get some common sense into this and lets free it up for all to edit their own posts at ANYTIME. Personally, I resent being treated like I don't know what is best for me! After all, "it" is my post and if I want to delete it, for what ever reason, then I should be able to do that. I do not know any other forum that places this kind of restriction on its members and it is frustrating to say the least, and maintain a semblance of politeness. First, we are all of us volunteers on this forum. Second, we are all learning as we go along. None of us are dedicated programmers. Personally, I am an artist and photographer. Nowhere in my job description does it say forum programmer. Third, a private message voicing a 'suggestion' first would be better received. Yes, we agree there are issues. Yes, we feel your frustration. Yes, we are trying our best to make things better, and, yes, there are only so many apologies we can offer you. Now, please try again and let me know if you can edit your post. It appears that someone has already edited to meet my initial question. My thanks to whomever did this. Welcome back. I am back as well. PeteD wrote: Welcome back. I am back as well. Thanks Pete. Where did you go? I was /am having health issues, was on several forums, and a bunch of other stuff going on at the same time and was frustrated with the having to login in each and every time I visited the website. So I took a vacation from here with occassional visits to check in on everyone until the issues were fixed. Was not mad or anything as they were doing all they could. Just had a lot going on and did not need another at that time. PeteD wrote: I was /am having health issues, was on several forums, and a bunch of other stuff going on at the same time and was frustrated with the having to login in each and every time I visited the website. So I took a vacation from here with occassional visits to check in on everyone until the issues were fixed. Was not mad or anything as they were doing all they could. Just had a lot going on and did not need another at that time. I can understand that. Hope all is okay now and that things are going well. Welcome back. 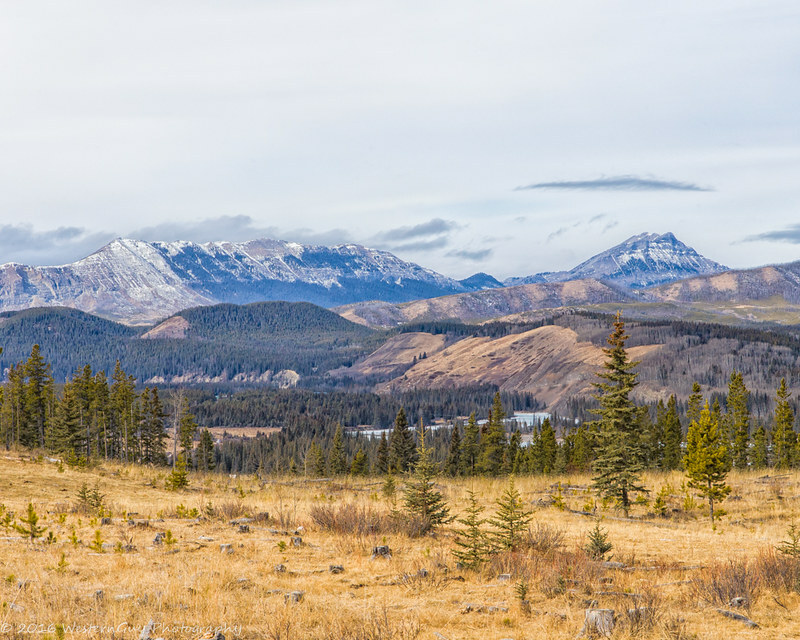 Sunday in the Foothills of the Rockies - Timber Creek Valley. As we headed north through the foothills, we came around a corner and this small vista opened up to us, so, naturally, a picture was in order . The 4Runner enabled me to get off the road and find a decent viewpoint for a shot. The dark clouds just coming over the mountains are harbingers of snowy weather to pass through later that day.